Emma is an experienced social worker and an accomplished executive leader in the community services and government sectors. She has worked extensively in the areas of child protection, family support, family and domestic violence, homelessness, and remote and regional Western Australia (WA). 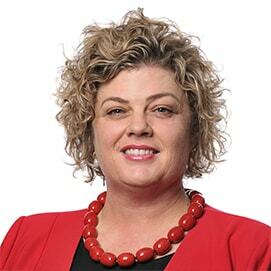 She is experienced in leading large and complex organisations, service delivery operations, policy and strategic reform, and significant stakeholder engagement and co-design agendas. Emma has a strong interest in co-designing policy and service delivery approaches that are location-based, outcomes-driven and people-centric. Delivered a five-year proactive social media strategy and managed contentious public policy issues as the media interface. Prior to Nous Emma worked as a front-line social worker in the areas of homelessness and women’s support services within the community services sector. She went on to perform multiple operational leadership roles in state government human service departments in both remote regional and metropolitan locations. Her desire to improve services, policy and life outcomes for individuals, families and communities has led her to take on roles in government, university and development sectors; focusing on efforts on policy development, service improvement and design and building leadership and workforce capability. Most recently Emma spent 14 years in the area of child protection and family support and was the director-general in her last four years of service. Emma holds a Bachelor of Social Work (Honours) and has been an active member of numerous boards and committees in human services over the past two decades. Emma loves spending time with family and friends exploring the remote corners of WA. She is learning to draw and adding artwork from emerging Australian artists to her eclectic collection.